The handiest water carrier yet, with sides that expand to increase capacity. 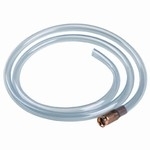 Made of high strength polyethylene, it features a comfortable carry grip and screw-on cap with on/off spigot. Size empty: 9.75" x 16" x 2.25". Capacity: 2 US gallons (8 liters).